This octagon outdoor table features a powder-coated 4" square pedestal base that supports the table top and seats. The single post allows for easy installation, cleaning, and maintenance; and gives the table a cleaner look. 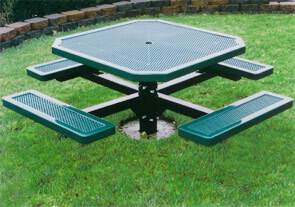 Octagon Outdoor Table comes standard with a 2-1/4" umbrella hole. Can be mounted permanently in-ground, semi-permanently with a surface mount, and portable. 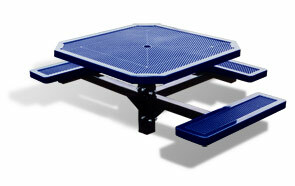 The top and seats are thermoplastic coated punched # 11 ga. steel for all weather durability. Your choice of vibrant colors shown in a slightly textured Polyethylene finish. Universal access ADA tables are modified with an overhang that allows for comfortable wheelchair access and complete clearance to the table top from one or two sides.